In the 1950s, the age of the automobile, car workshops and showrooms the size of shopping malls became a frequent sight on urban peripheries. The concrete, steel and glass Schlotterbeck Citröen Garage in Zurich, designed in 1951 by Basel architects Suter & Suter, is a perfect example. But needs change and cities evolve. Now, 65 years later, the site is part of the dense city structure and space is at a premium here. The listed building, with its double helix access ramps, has escaped demolition but is being transformed into a hybrid commercial and residential project by giuliani.hönger architects. 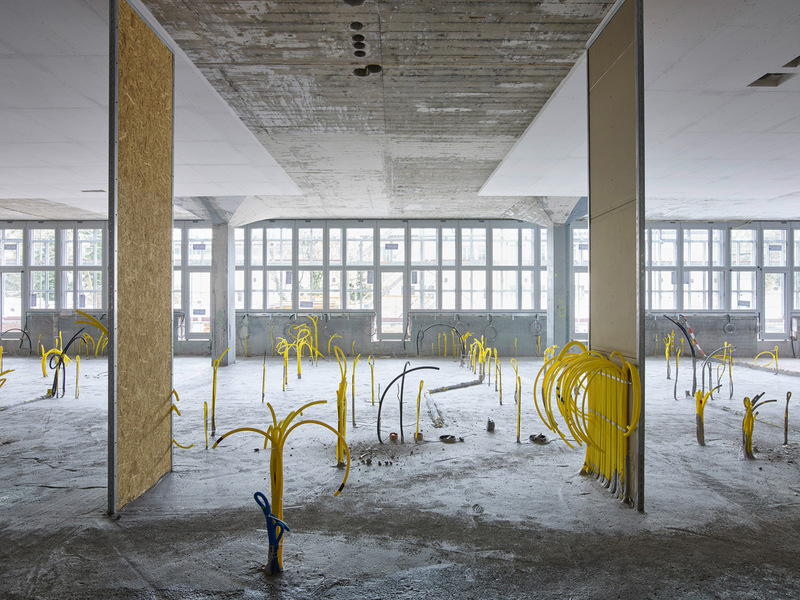 During the conversion phase, the changes taking place within the structure of the building are being documented by the Swiss photographer David Willen. Permanence, ruin, renovation, conservation and preservation have also shifted a lot in our understanding over time. Willen’s images preserve for us these transient scenes and spaces that we have learned to value. Through his eyes we see a building undergoing change as a work of art, the incisions and demolitions like so many Gordon Matta-Clark cuts; found remnants shot by Willen with near pious care; or a roomful of wooden supports that are reminiscent of David Chipperfield’s 2014 art installation of 144 tree trunks in the Neue Nationalgalerie in Berlin. This project connects the deeper dimension of time to three-dimensional space and compresses it back to us in two-dimensions in the form of images. Willen understands the aesthetic kick we get out of the intersections of great effort and entropy; the inevitable mortality of things and the nascence of the new. Through this ongoing project we get to see not just the rebirth of a building, but the birth of an artwork as well.